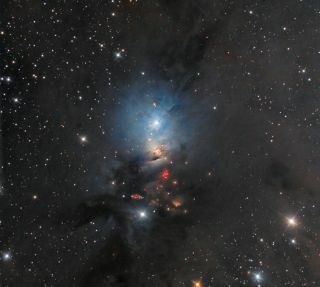 Astrophotographers Bob and Janice Fera took this photo of NGC 1333, a reflection nebula in Perseus, on Nov. 5, 6, and Dec. 10, 2012 from Eagle Ridge Observatory, Foresthill, Ca. They used an Officina Stellare RC-360AST 14" f/8 Ritchey Chretien Cassegrain telescope with two-element field flattener to observe the nebula. An Apogee Alta U16M CCD camera with Astrodon filters was used to capture the photo. NGC 1333, a reflection nebula in the constellation Perseus, dazzles in this night sky photo. Astrophotographers Bob and Janice Fera captured this photo on Nov. 5, 6, and Dec. 10, 2012 from Eagle Ridge Observatory, Foresthill, Ca. The Feras used an Officina Stellare RC-360AST 14" f/8 Ritchey Chretien Cassegrain telescope with two-element field flattener to observe the nebula. An Apogee Alta U16M CCD camera with Astrodon filters was used to capture the photo. Located about 1,000 light-years away, NGC 1333 is a reflection nebula at the edge of a star-forming cloud. These nebula are composed of clouds of gas and dust that are visible with help from the energy of nearby stars. The blue particles are more visible in an image because carbon dust reflects blue light more efficiently than red light.